Maximo Mida is the newly admitted lawyer with the law firm of Ramp & Mida in Pohnpei, FSM. He grew up in several different places including Chuuk, Pohnpei, and Hawaii. After he graduated high school, he enlisted in the U.S. Coast Guard and became one of only few to be called a helicopter rescue swimmer. When he wasn’t jumping out of helicopters on a search and rescue mission, he spent all of his time outdoors either surfing, participating in short triathlons, hiking or canoe paddling to name a few. At night he pursued his B.A. degree at Chaminade University in Honolulu. After serving twenty years he was honorably retired. Not content with retirement and with his degree in hand, he charted in the aspiring footsteps of his younger brother Kembo Mida Jr. and applied to law school. In 2017, he earned his J.D. from Thomas Jefferson School of Law in San Diego. 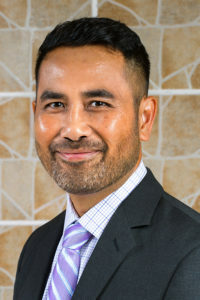 Without hesitating, he simultaneously took the Guam and FSM bar exams and passed, to which he is currently licensed to practice in both jurisdictions. Up to now, he finds the practice of law both fascinating and gratifying. B.A. from Chaminade University, 2008. J.D. from Thomas Jefferson School of Law, 2017. Guam Bar: Active since November 2017. FSM Bar: Active since February 2018. Served 20 years in the U.S. Coast Guard.